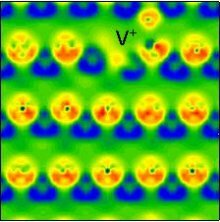 Scientists were surprised to find that electrons jump between ions when material is exposed to low levels of radiation, and how the charged vacancy, shown in yellow and indicated by V+, is formed. Results: Radiation can come in a seemingly benign form like sunlight or in a more destructive form to materials, as in nuclear reactors and outer space. Either way, radiation interacts with the materials it touches. Understanding how those interactions damage or affect the properties of the material has challenged traditional computer modeling and simulation approaches. Now an international team led by scientists at the Pacific Northwest National Laboratory has shown that how electrons respond to radiation in a solid can alter the way permanent damage is created in the material and radically affect its mechanical, magnetic, electrical, and optical properties. Why it matters: Hard materials such as the steel used in nuclear reactors or natural minerals such as diamond look stable, but radiation exposure kicks the material's atoms off their highly organized lattices as ions that move freely inside the lattice. Previous studies led scientists to believe that the ions smashed into each other like cars in a demolition derby, with each ion car being a hard particle with immovable electrons embedded in the car's surface. At the Pacific Northwest National Laboratory, scientists like Dr. William Weber, Dr. Fei Gao, visiting scientist Dr. Haiyan Xiao, and their colleagues in Germany and China are finding that simply isn't the case. Instead of being embedded in the ion cars, the electrons sit like a cloud of exhaust around each ion, and they can actually leap from ion to ion and back again. The way they leap affects how the ions react to each other. Ions may move farther apart or closer, speed up or slow down. "We need to understand at a fundamental level how energy is transported by both electrons and ions," said Gao, one of the key material scientists on the team. "We used much higher-level theoretical calculations to look deeper than the level of the atom to understand the response and role of the electrons." "Understanding how defects are formed helps us understand how material is changed by radiation, which is important for safe nuclear power and space exploration," added Weber, who is a Laboratory Fellow and a Fellow in the Materials Research Society. Methods: In a relatively new approach, the scientists used a single blast of low-level radiation to create damage, or atomic defects, in a silicon-based material so they could study the movement of both the electrons and silicon ions. Using supercomputers at EMSL, a DOE national scientific user facility, and the National Energy Research Supercomputing Center, the researchers found that electrons jumped back and forth from the moving silicon ion to surrounding atoms. This movement ultimately created permanent defects, or damage, in the material. The researchers also found that electrons can be trapped by the defects created. The work is the first time such intensive calculations could be performed. The team, which included researchers from China's University of Electronic Science and Technology and Germany's Institute of Ion Beam Physics and Materials Research, modified state-of-the-art software and took advantage of recent advances in computer hardware to perform the calculations. "When we bring together our strengths," said Weber, "we can rapidly advance the science." What's next: Weber and Gao and their colleagues hope to apply the work to more complex materials to look at how trapped electrons affect the way defects move and interact with each other when the material is exposed to more than one blast of radiation over longer times in much larger systems and at higher levels of radiation. Improved understanding and modeling of how electrons and ions respond to radiation will lead to improved materials and performance in safely managing nuclear fuels and waste forms. "Our current work is a snapshot," said Weber. "We want to fill out the whole picture." Acknowledgments: This work was a collaboration among the Pacific Northwest National Laboratory, which was supported by the DOE Office of Basic Energy Sciences; the Department of Applied Physics, University of Electronic Science and Technology of China; and the Forschungszentrum Dresden-Rossendorf, Institute of Ion Beam Physics and Materials Research in Dresden, Germany. Some calculations were performed on the supercomputer at EMSL, a DOE national user facility.